A fun cute portable chicken coop cottage! Light and functional. Aloha! Okay, there is really nothing Hawaiian about this cottage coop except where it is located. LOL. But, I thought it was a rather exotic name which might make this page a little more interesting to read. My name is Joan and I have two little silkies, one white and one blue. In my attempt to build them a home, I wanted to make a coop that is both light and functional ... and cute. I live in a small community and I wanted to make sure the coop fit in the neighborhood. I knew that I would need to leave it in the front yard, which means most of the morning traffic passes by. Plus, I have a small yard that my dog needs to share with the chickens so size was definitely a factor. Also, I didn't want bare spots in the yard so I tried to create a coop that was light enough to move around the yard by myself. Together with designs inspired by MSBEAR and her husband and others on BYC, this is what I came up with. As you can see, I started with a plan, well, sort of. I'm just including the plan here to prove that I actually put some forethought into this ... until I realized there is a huge difference between having a plan and actually building something that chickens could live in! As Peter Druker said, "Plans are only good intentions unless they immediately degenerate into hard work." So I figured what the heck and just dove in. These are the two nest boxes I made. They are about 10"x9". I don't know where I read it but there was some advice that 9"x9" were adequate for bantams. It's a bit of a tight squeeze as you will see later. At this point, I forgot to document my progress ... so here is the coop with the walls done and most of it painted. I like that yellow. It's a happy color. AND, this is about the time we got three straight weeks of rain, which warped the 3/8" plywood walls to the point I couldn't open or close the door anymore. So I rebuilt the door and reinforced it with some braces. The rain also made me realize that my windows were WAAAY too big. I could just imagine my girls freezing their fuzzy butts as horizontal rain shot through their coop. So, I installed a door/window within the side door to open on warm days and close on cold and wet days (see subsequent pics). Next, I propped the top section on four legs of 2"x4"s that are 2.5 ft long, wrapped it in hardware cloth, and put in the ladder and flower box (below).I also framed the windows and used hardware cloth to cover the windows from the inside, allowing lots of light and ventilation whilst preventing rat and mongooses from stealing eggs (they do that here!). Then, I installed the asphalt shingle roof on some recycled 5/8" plywood and tar paper, using one ream of shingles (~$26). Hmmm, yes, the ROOF. The asphalt shingles look really great but they are HEAVY! Seriously, it took two strong friends and me to hoist the roof up there! That required a redesign of the coop otherwise, there would have been no way to move it out of my garage! The next question was, "How do I turn a coop into a chicken tractor!??!!" Creating a ladder with two landings allowed me to install it with a more gradual angle yet maintain space. If I did a straight run, the ramp would have been more like a slide! This is Lily and Daisy, who have already moved in. They were very accommodating and did not seem to mind me crawling into the bottom section with them to drill, screw, and grunt. LOL. Seriously, at this point the coop weighs a ton. Well, not quite a ton. The only way I figured I could move it was to apply some of my college physics to the problem and turn the coop into a tractor. I installed tires on the two back legs (10" metal, solid rubber, 1/2" bore, 80lb load capacity for ea, ~$9 ea) and added post braces on each leg. By using two 8-ft handles (two lengths of 2"x2"s glued and screwed together) that I slide into the braces, I create a wheelbarrow effect to wheel the coop around the yard. Of course it meant redoing the doors to accommodate the tires but it was worth it! Now I can easily move it myself and it doesn't weigh more than 20 lbs! If I need to, I can remove the roof to make it even lighter. Lily and Daisy seem pretty happy with their new home. I let them free range around the yard when I'm at home. The next thing I will do is make a lightweight run (I hope) using the leftover wood and some recycled chicken wire so they will have more room to run around while unattended. I've seen a stray cat in the neighborhood sizing up the girls so I'm not taking any chances! It's cute and just right for our climate. It is virtually predator proof. I used hardware cloth (0.5") around the bottom section an also in all of the open eaves. The whole side of the top section opens for ease of cleaning and the little door/window set in it provides extra light and ventilation when needed (It opens to reveal a window covered in hardware cloth). I like that the top section is the perfect height for me to clean or collect eggs without needing to bend over at all. I can move it myself! I'd start with a REAL plan. While I enjoyed the problem-solving aspects, I think some initial planning would have saved me a lot of time. I'd use corrugated PVC for the roof. Asphalt shingles are WAY too heavy. I'd use a wider tire with a higher load capacity (i.e, 175 lb, 5/8" bore) to accommodate the weight of the coop. The coop is actually much heavier than what the tires are coded for so they are already bowing. I would have made the nest boxes a little bigger. As you can see, neither hen uses it. I'd brush up on my physics, algebra, and geometry. When I was in school, teachers said I'd use it someday. I just didn't realize it was THIS day! Thank you everyone that has ever contributed to the coop design and construction page because I've perused every single one and I used your ideas to create a home for my two girls! And thank you MSBEAR for your cute and totally awesome designs. As you can see, I used some of your ideas. Thanks for stopping by! N F C likes this. Its a little small for my liking but love the color and set up. Especially the pop door on the floor of the coop not the side! I could see me having the hubby make for my chicks that leave the brooder! Thank you for sharing! Good job, very cute coop! Thanks sophiesmith1010 and Egg Thief! Beautiful! I love it and your silkies! Hope your coop is coming along Horseychicken! Thanks Birdbrain1948! Isn't it fun just thinking about it? It's almost as fun as building it yourself. Good luck to both of you! Another beautiful coop! My head is swimming with all the ideas, but I need to make a decision soon about what will be the best for me to attempt. Thank you! that is SO cute! I wanna do this for four chickens ill be getting, but i wanna paint it like a barn red! So cute! Hi Ceeceerod. It houses 3-4 silkies if they have a larger run. I originally built it for 2 but found that 3 do well and 4 might be cozy. how many chickens does it house? I'm so glad to hear it bpbray! I was worried the first night because they weren't using the gangplank. My husband assured me that they would figure it out. And sure enough they did by the second night. No worries and they love the extra room! Thanks for your response. Thanks barredrocks755 and AlicesSilkies! It was fun to build! Hi bpbray! Congratulations on the new coop! I'm sure your little ones are very happy. Have your chickies tried out the gangplank yet? I got mine used to it by putting them inside and having them get used to a safe place to roost. I think I picked them up and placed them inside for the first night. Then, I let them figure their way out the access door to feed below (they can see the food if they stick their head through the door).By the next night, they figured it out and went up the plank themselves. Best of luck to you! I love your coop! My husband just finished a two story coop for our crew and, like yours it has an access door with a "gangplank". Did you have any issues with Daisy and Lily getting used to using the gangplank. Ours haven't figured it out yet. Thank you! Amazing!! 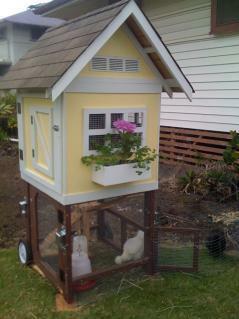 My silkies would be sooo jealous, definatley time i made them a new house!!! Love it!!! I love the coop it might be just perfect for my backyard! love it, especially the ramp idea! my big problem is the space- and you solved it! I did try at Lowes - but didn't have any luck. It could have been that the young man I talked to just didn't know I'll try next time I'm there. Thanks! Hey there - your coop is beautiful! We are using some of your concepts in designing our coop. Mainly the wheelbarrel idea I've tried to find the braces that you used to slide the 2x4 'handles' into but haven't had any luck. Can you tell me where you got yours? And maybe what they were called? This is a gorgeous coop! We're in the process of building a new one for our girls and I want to apply a cottage-style to it. This has definitely given us some inspiration. Well done! Thanks babychickens123! It's so much fun to check out the coops, yeah? I did too. You might check out MSBEAR's coops. Her husband built them and they are dandy! Thank you so much vintageozarks! You are so kind. That means a great deal to me. Thanks again! I'm planning my coop now. I have downloaded Google Sketch but haven't started learning how to use it. Thank you for all your tips on what you wish you'd have done differently. I think you built just about the prettiest chicken coop I have seen to date. Is Millie sick? Advice please!